The Kicker Tea Tumbler - How it Works from Kicker Studio on Vimeo. What kinds of stories would take place here? The obvious are haunted and involve ghosts, but what are the not so obvious stories hidden in the decay? Incredible music visualizations. Learn how they're done. So, first off, what's a "desire path"? But can there be such a thing as a desire path when dealing with software, or websites? I've seen plenty of situations where software users have created elaborate real world workarounds to make up for badly designed software. Can you make the case that these represent user desire paths? The shortest distance between two points--the task, or goal, and the completion of a task or goal? So, do these stickies, and printout books, represent desire paths? They are definitely short cuts. Are they communal? Often coworkers teach other coworkers how to make them, so that they too can short cut the "pain points" of the crap software they are mandated to use. Or am I just pushing the metaphor too far? Whatev... I'm gonna start slipping digital or user desire path into conversation, and see if it sticks. GM to move 50% of ad budget online in 3 years. GENERAL MOTORS will shift half of its $3 billion advertising budget to online and one-to-one marketing within 3 years. That indicates a rapid increase over the $197 million GM spent online last year. The company plans to embrace a wide variety of formats, including gaming, search, interactive applications and more. More interesting, and telling news for those of us who work in what used to be lovingly called the convergence space. (What was it that was supposed to be converging again?) Apparently GM is going to be focusing $1.5 billion on gaming, search, interactive ads, and more. Where does "Blue" end and "Red" begin? A fascinating project that used the Amazon Mechanical Turk to have random people name the color presented to them, and then created this beautiful map of how we name colors. The City That Never Sleeps or Stops Talking. An interesting article about making a living as an artist in the era of the long tail. One thousand is a feasible number. You could count to 1,000. If you added one fan a day, it would take only three years. True Fanship is doable. Pleasing a True Fan is pleasurable, and invigorating. 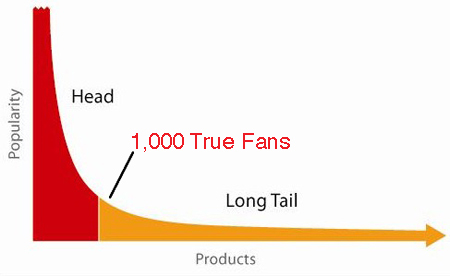 It rewards the artist to remain true, to focus on the unique aspects of their work, the qualities that True Fans appreciate."